As someone who writes of gardens and homekeeping, I speak to many garden clubs filled with Baby Boomers. When I mention in my talk that I wrote a book for 20-30 Something Gardeners, I’m always surprised at their responses. First, Baby Boomers don’t believe 20-30 Somethings garden. Some Boomers think the next generation is lazy, but they’re not. Millennials are smart and simply have different priorities. We could all learn a few things from them. Millennials are the second largest group of people buying garden related merchandise with Boomers only a little ahead of them as consumers. Does that mean 20-30 Somethings are hooked on the latest lawn mower or string trimmer? No, they’re part of a generation committed to owning less. Ever hear of the 100 Things Challenge? It’s a minimalist’s dream, and many in their twenties and thirties work hard to achieve it. They’re more likely to buy a few containers or raised beds, along with a patio chair. A Millennial would tell you to start small and enjoy the view. They would also say to try traditional methods of agriculture and hand tools over something that runs on fossil fuels. Witness the resurgence of the broadfork in organic community gardens, for instance. Second, Baby Boomers are envious of the book’s title. I reassure them that although The 20-30 Something Garden Guide, a no-fuss, down and dirty Gardening 101 for Anyone Who Wants to Grow Stuff is geared toward Millennials, it also reaches out to people of all generations—especially those new to gardening. Besides, no matter how many days you’ve walked this Earth, most of us feel like we’re 25 or so inside. Even though people in their twenties and thirties are grouped together as one generation, they lead very different lives, so many of their priorities are also different. Having just graduated from college, 20-Somethings are getting their first real “place" since moving away from their parents, and they feel like they’ve always been in school. That’s because they’re part of the best-educated generation in America. This group also wants to enjoy their lives, not just climb an ever-changing corporate ladder. They saw their parents do that. Millennials, especially those in their twenties, are willing to buy the smaller house so long as it comes with an interesting and vibrant neighborhood. Their gardens are smaller and often urban. They tend to live where the rent or cost of living is less expensive. Sometimes, that means quirky and cool neighborhoods on the edge of becoming the next big thing. That's good, because neighborhood covenants and restrictions don't tend to be as stringent as in planned suburban communities. What can we learn from this? Be flexible, and keep things interesting. Live and garden with less. Millennials don’t want or need the carpet of green lawn tied to suburbia to be happy. They don't want to spend their weekends caring for lawns or anything else that doesn’t benefit their lives. They have goals, but on their off-time, they want to have fun. If they garden, “the plants need to do something” as my daughter Megan, 21, says. Like others of her generation, she’s not impressed with a lawn monoculture, or the chemicals and herbicides to keep it green and growing. Millennials see gardening as an extension of their homes. So, they’re willing to spend money on pretty containers, great outdoor furniture, and they may even call in a professional to help build raised beds and draft a cohesive design in their back or front yards. They were raised on edible landscaping, and they want it for their own homes. They could care less about anything that doesn’t’t help them, their children or pollinators. You see, they know pollinators are in trouble too. What’s the lesson here? Grow plants that are interesting and do something for you while helping the environment too. They would also tell us not to work so hard in the garden that we forget why we’re gardening in the first place. While both their parents probably worked two jobs to keep everything running smoothly, Millennials are more concerned with living life to the fullest. Those in their late 20s and early 30s may also be starting families. Mothers and fathers equally want to spend time with their children, and again, they’re willing to make the sacrifices needed to do this. They’re passionate about organic gardens, beautiful flowers and pollinators, and they want to teach their own children how to grow. Millennials are the grownups who enjoyed sunflower houses we grew for them when we were young parents. What else can we learn from Millennials? A lot it would seem. They love growing things, but they don’t take gardening too seriously, and they’re willing to wait before going too big. They’re concerned about the food supply, but because they were taught about environmentalism from the ground up, they don’t throw their hands up in despair over GMOs, herbicides and pesticides. Instead, they want to know how to fix the broken food system one container at a time. They understand the food supply needs repair, and so they’re willing to spend their money at stores with organic produce, plus grow their own. Baby Boomers may not want to relinquish their status as top garden purchasers yet, but it’s comforting to see that the lessons taught to this generation weren’t lost. They were simply refined for the circumstances that now exist. This generation has its own priorities and challenges, but they have much to teach us too in the garden that we call life. It’s up to us to listen and learn. Dee Nash is a professional writer, speaker, and gardener born and raised in Oklahoma. Dee gardens on an acre or so and grows everything she can. She is a frequent contributor of writing and photography to Oklahoma Gardener magazine. Her writing has appeared in Organic Gardening, Fine Gardening, Flower Magazine, and other publications. She also writes for Fiskars Corporation. She is a member of the Garden Writers Association, the Oklahoma Horticultural Society, and Great Garden Speakers. 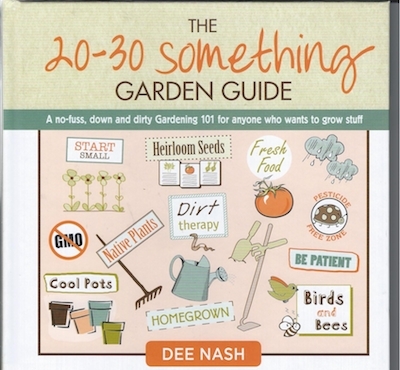 Follow Dee online at http://reddirtramblings.com/ and purchase her book, The 20-30 Something Garden Guide from booksellers and online. ISBN-13:978-0-9855622-7-4.